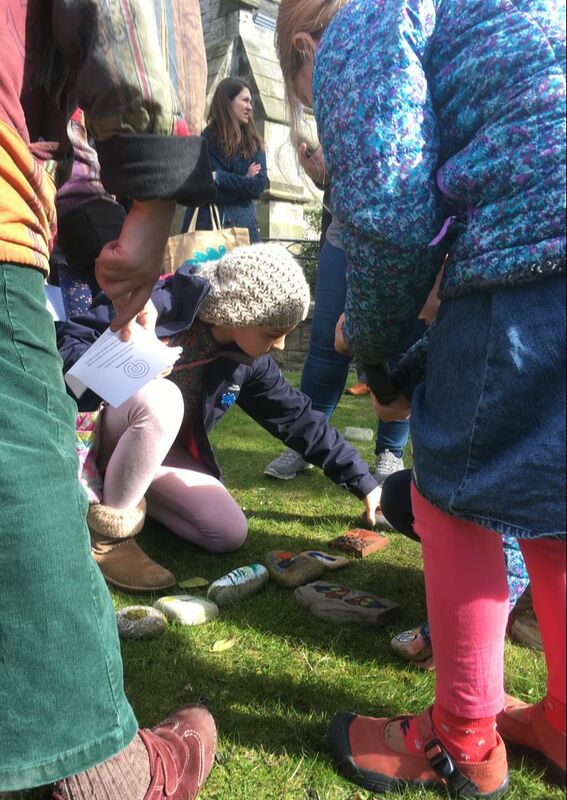 Residents of a particular village in Scotland were invited to collect together items of personal significance to populate a memory box. In interviews, each person then shared the significance of the objects selected, their thoughts about memory and its relationship to objects, together with their feelings about living in the village. Edited versions of these interviews compare and contrasts the different approaches to making and recalling memories and gives a privileged insight into the lives, preferences and priorities of others, celebrating the richness and diversity that those that live in Kirkmichael bring to the place, making it what it is. 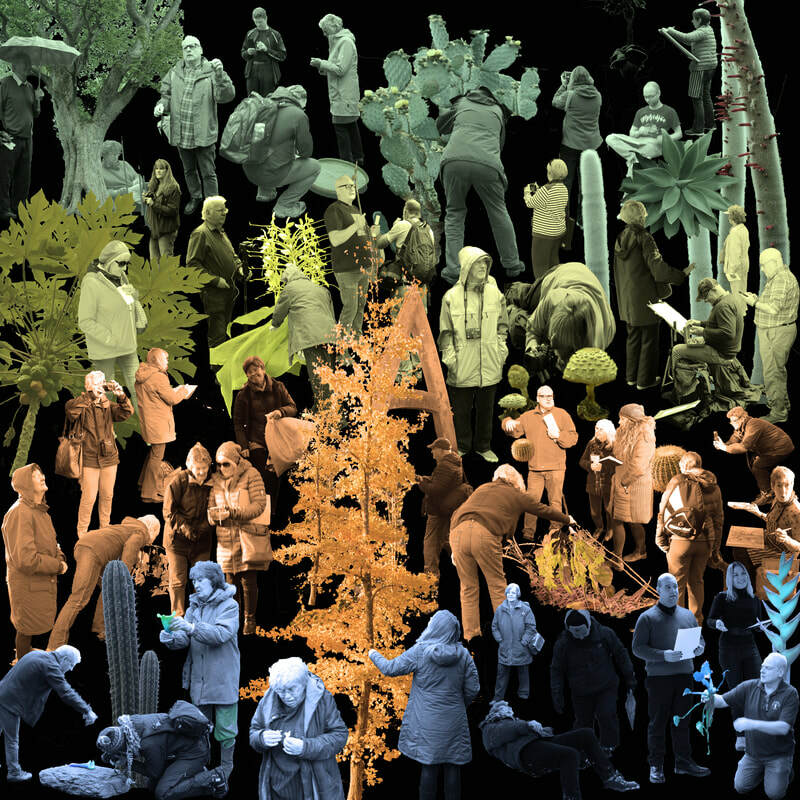 Anthology Project Focus days, organised by the Friends of Dundee Botanic Gardens, brought various artists into relationship with one another to explore together the mysteries of the vegetation. 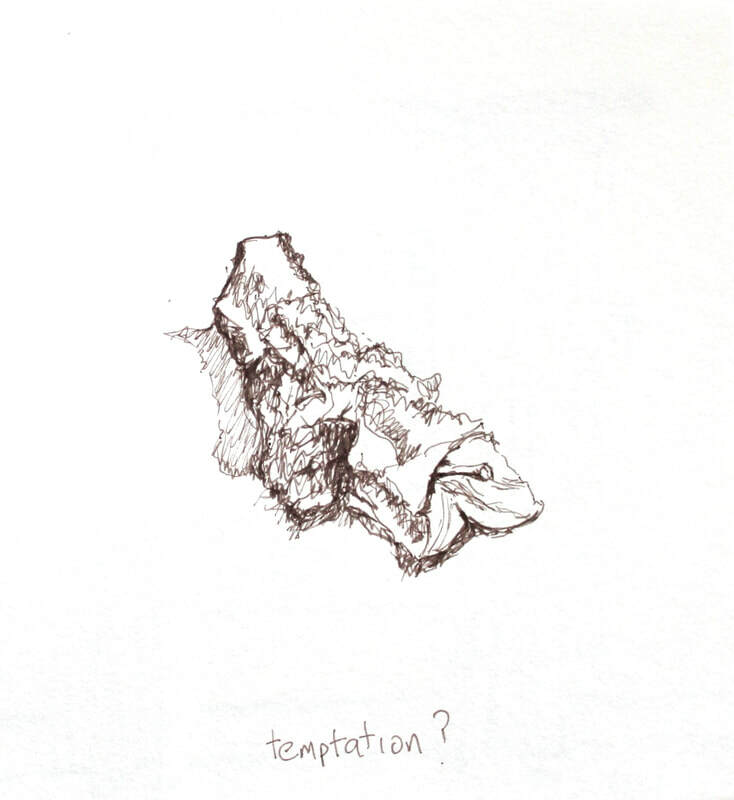 This documents something of that process and explores the participant’s sense of identity as artists. Here, the artists, who are normally invisible to those looking at their work, become visible, having become the subject of the artwork. Collaged together with very little context, the composition suggests the liminality that artists can create, where for a short time, perhaps the unimaginable is possible. ​‘ The artist, like the God of creation, remains within or behind or beyond or above his handiwork, invisible, refined out of existence’. Designed specifically to be part of the Bield at Blackruthven's twentieth anniversary celebrations, a sundial provides the framework - an interactive structure into which participants can place their own markers or moments in time, sharing memories and emotions of the significance of this particular place over the past twenty years to complete the installation of Time in Eternity. 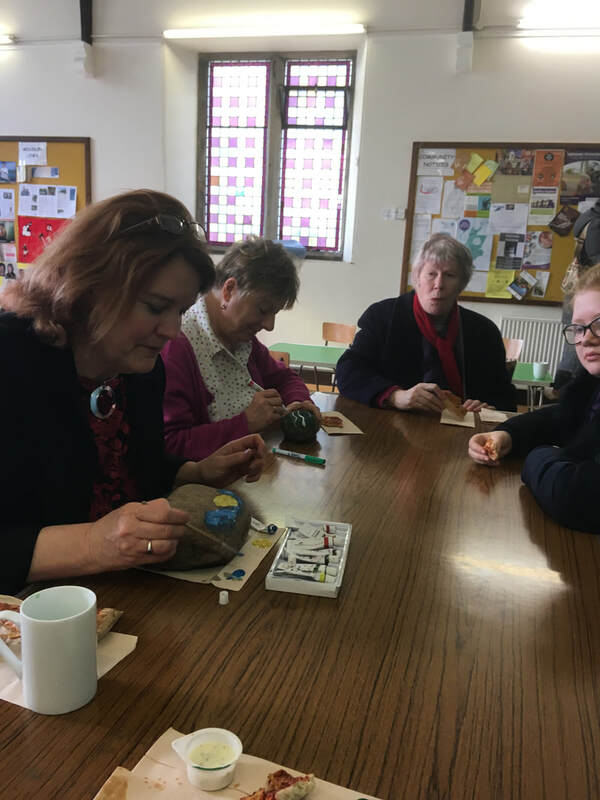 ​Each member of this ecumenical retreat group was given a 'favour' a small boxed gift of some creative materials together with a bible verse for them to ponder whilst on retreat. Their creations and thoughts were shared together in a celtic liturgy of thanksgiving at the end of the week. 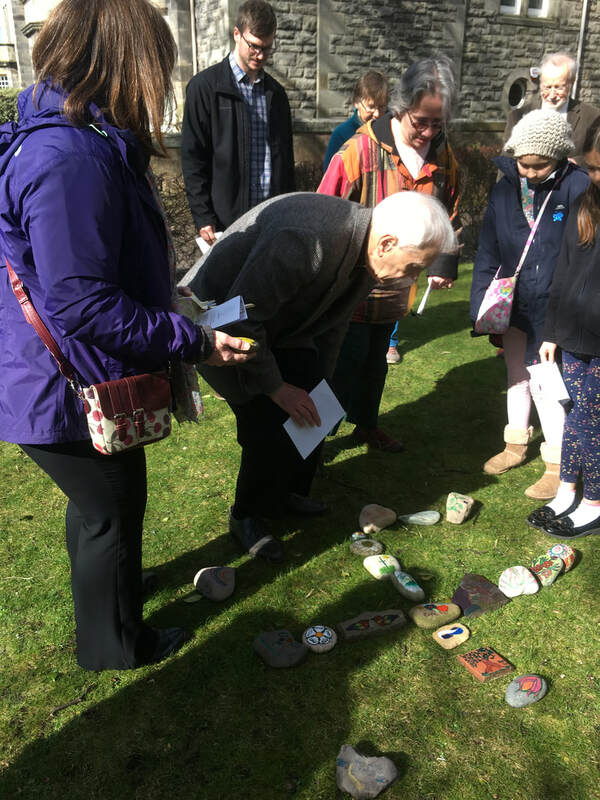 Members of the congregation of St Andrews Episcopal church were invited during lent - a time when traditionally Christians think about and prepare for future events in the life of Jesus, to think about what promises they would like to make for the future. 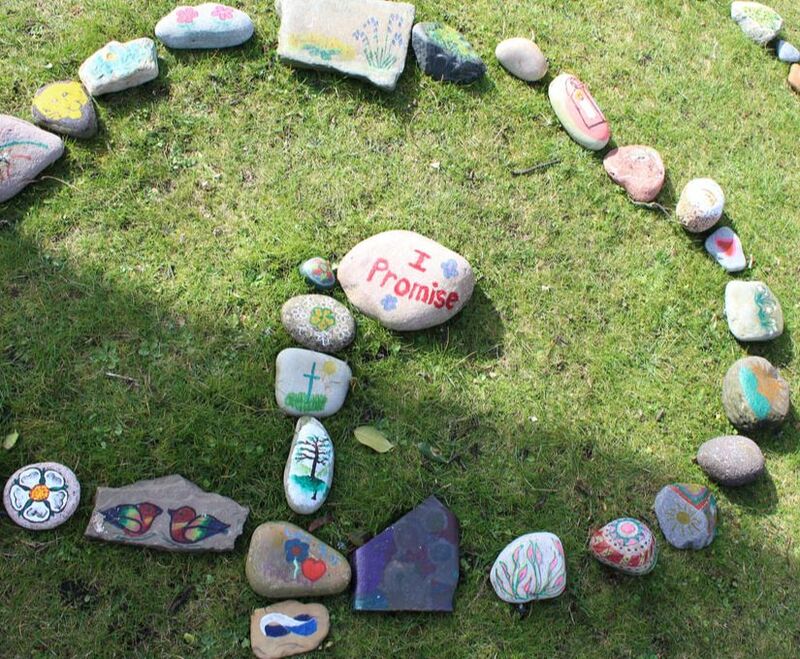 The promise remained a secret between them and their maker, but as a token of each promise a stone was found and decorated and then laid with others to form a temporary labyrinth which became part of the After the Call exhibition. Is life defined by chance or choice? - this interactive game of time, space and place, is a combination of the two. 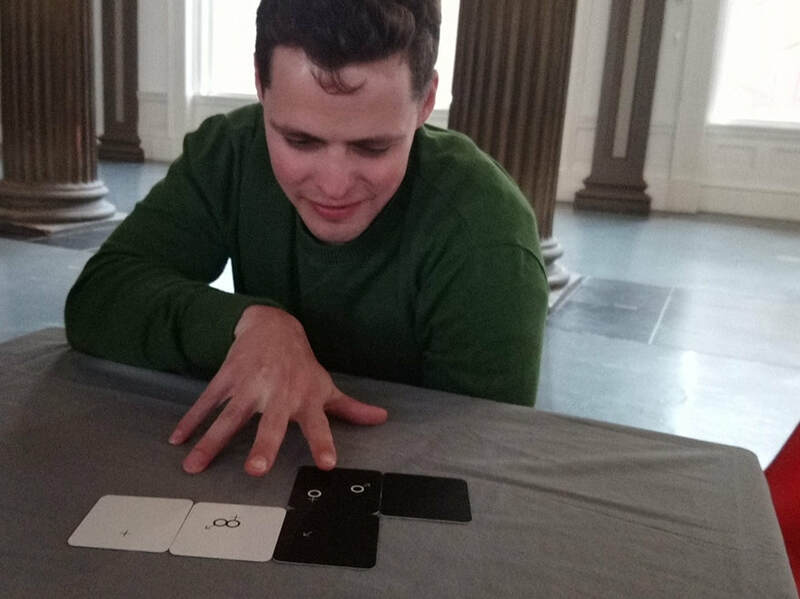 each person is dealt five random cards, and then arranges them in a way that has some meaning for them, revealing something about themselves? - are we all different or all the same? 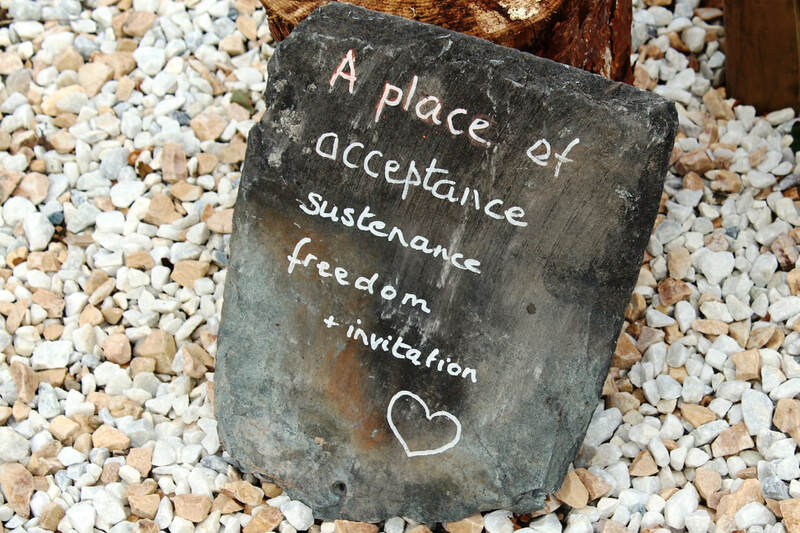 Participants - a group of 14 people on a residential retreat together were invited to write a word or a phrase that described what they were thinking or feeling every time they passed the collection box. 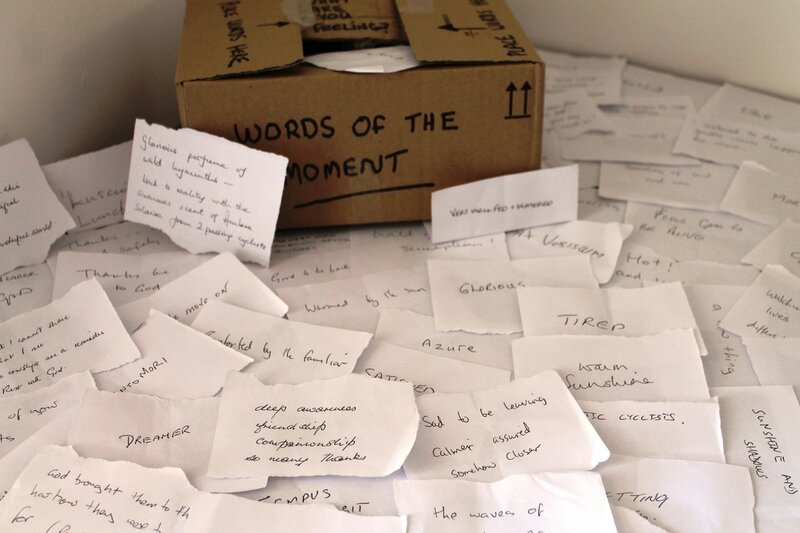 the box was emptied each evening and the contributions assembled together to make up a poem which described both the collective and individual experiences of those involved. ​People see the same thing quite differently, but we assume everyone sees the same as us don't we? views change depending on which way we look, and where we are standing - it is all about distance and perspective. Standing back makes quite a difference, and height can be important. sometimes it looks better the lower your perspective. We choose what it is we want to see. 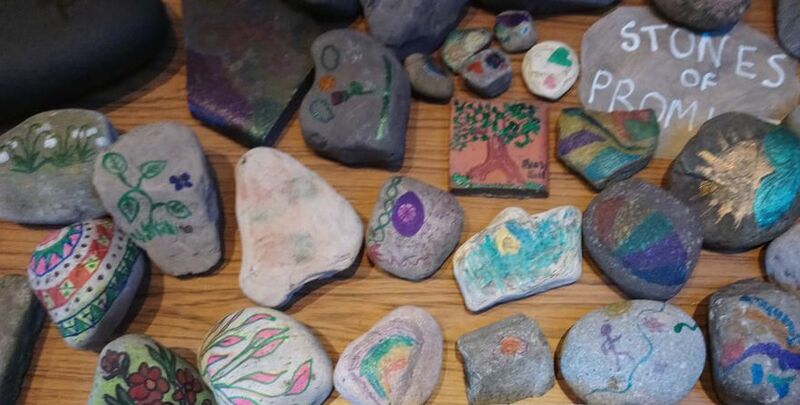 Working with volunteers from a particular church, this project explores their hopes, fears and faith journey in a way that others can relate to. .The material used was collected during a series of 1:1 interviews. Objects selected intuitively as being of significance for each person were then used to frame extracts from the interview notes which were exhibited in the High St of the local town during the run up to Christmas. The exhibition was designed to challenge the commercialisation of a traditional festival of peace and goodwill providing a reflective space in the marketplace amidst the business of shopping for presents and festive feasts. Inspiring others to be creative, appreciate and enjoy the natural environment and perhaps engage with this environment in a new way. All the changes lasted only a few hours before the canvas was cleared once again by the incoming tide. Exploring issues of identity, relationships and forgiveness using mandalas. An integrated structure, organised around a unifying centre. represents wholeness or unity - a reminder of our relationship to the infinite, the world that extends both beyond and within our bodies and minds, as well as conceptual circles of friends, family and community. 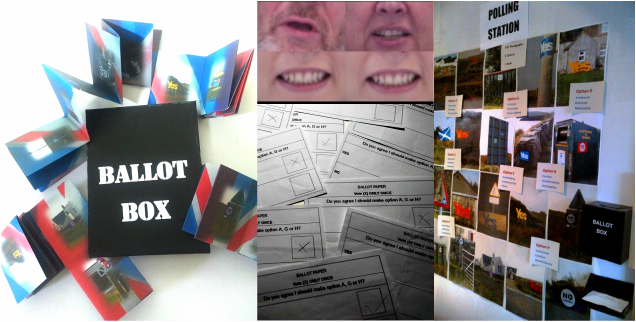 To me a simple YES or NO to the question of Scottish Independence, with little information being given on the how and what ifs of the decision people were being asked to make seemed just too black and white for an issue shaded in much greyness. I embarked on a series of events asking people closed questions and holding a confusing ballot of my own to highlight some of these issues.